In October 2014, AviaSolutions secured the contract to provide commercial and technical due diligence services supporting the Ardian and Credit Agricole Assurances consortium bid for F2i. In February 2015, it was announced that terms had been agreed with F2i Aeroporti S.p.A. for the acquisition of a 49% stake in the business. F2i Aeroporti is the holding company of F2i First Fund which owns 35.7% of SEA S.p.A. (Milan Malpensa and Linate Airports), 70% of GESAC S.p.A. (Naples Airport) and 54.5% of SAGAT S.p.A. (Turin Airport). These companies individually hold stakes in SACBO S.p.A. (Bergamo Airport) and SAB S.p.A. (Bologna Airport). These airports handled a total of 37 million passengers in 2014, equivalent to 25% of the Italian market in terms of passengers. The total turnover of the network is approximately €900 million. 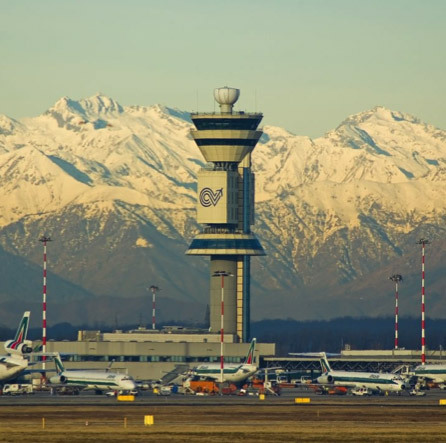 AviaSolutions’ research and analysis supporting the consortium bid for the stake in F2i included a detailed assessment of the potential for traffic growth at each airport, focusing on the Milan system. Milan airports have a large catchment area, with over 10 million people living in Lombardy (16% of the Italian population) generating significant outbound demand. Milan is the industrial and commercial hub of Italy, with regional GDP per capita well ahead of Europe and Italy, supporting future economic growth in the region. Milan is the gateway to the Italy’s lakes, including Como, Maggiore and Garda and the Italian Alps which are major tourist destinations that drive inbound demand. Malpensa is the main international gateway to Milan with adequate capacity to continue growing without significant further investment. AviaSolutions also developed an independent business plans and reviewed management’s capital investment programme for each airport in the F2i portfolio. Aeronautical revenue is regulated by ENAC, and the tariff system comprises airport fees, fees for the use of centralized infrastructure and shared assets and security fees and tariffs for the use of facilities by airlines and handlers. ENAC establish the consultation procedures for airport users including provision of information on operating costs, investments, service quality, environmental quality which determines the above user charges and fees. Non-Aviation revenue is generated from commercial services for passengers, operators and visitors which are both under direct management and operated through concession agreements with third parties. The primary sources of revenues are retail and car parking. In 2014, the retail offer at Linate and Malpensa was redefined, especially the non-Schengen area in Malpensa Terminal 1. AviaSolutions supported the consortium throughout the sale process and following EU anti-trust approval, putting to good use our extensive knowledge of the economic regulation of airport charges, awareness of the drivers of commercial performance and comprehensive understanding of Alitalia and the Italian airport system.